Published 16.06.13. 140 pages ISBN 978-1-898576-38-9. Ever find yourself saying ‘They don’t make ‘em like that any more?’ Well, let Eric Midwinter usher you down memory lane shining his uniquely perceptive torch on some of the great films and radio programmes of the past. In Best Remembered (One): a hundred stars of yesteryear (2002) ~ Eric Midwinter offered concise portraits of one hundred entertainers and the like who would be ‘best remembered’ nostalgically by those whose earlier life focused on the mid 20th century. 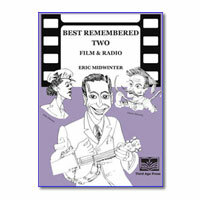 In Best Remembered Two: Cinema and Radio he turns to the key vehicles for entertainment in those same years, cinema and radio, coupling succinct analysis of their impact with evocative profiles of leading British films and radio programmes of the 1930s, 1940s and early 1950s. It is feast of memory-tugging delights for the older reader and a mine of historical treasures for the young.